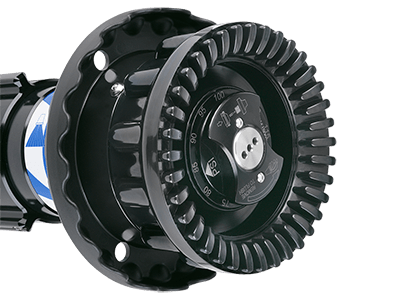 The series offers a wide range of superior flow performance. 150-1000 gpm, 300 – 1250 gpm, 300-2000 gpm, and 600 – 4000 gpm ranges are readily available based upon firefighting needs. Manual and electronic remote nozzles are available. Adjustable from straight stream to a dense fog pattern with a flow range of 150 gpm – 1000 gpm. Models are available with either automatic pressure control, selectable gpm with five gallonage settings, or factory ordered fixed gpm models. All Master Stream series nozzles are also suitable for use with foam and accept the FJ-LX-M FOAMJET low expansion air aspirating attachment. This model has the ability to produce an excellent hard-hitting stream at any flow from 300 gpm to 1250 gpm (1100 l/min to 4800 l/min). It’s easily adjustable from a straight stream to a wide dense fog pattern and is standard with a rugged aluminum bumper with fixed fog teeth. The nozzle features a selector ring behind the shaper that allows flow selection or flushing the nozzle of debris without shutting down flow.The Master Stream 1250 with Flush is suitable for use with foam. The series has the ability to produce an excellent hard-hitting stream at any volume from 300 gpm to 2000 gpm ( 1100 - 8000 l/min). It is adjustable from a straight stream to a dense fog pattern. These nozzle features TFT’s exclusive pressure adjustment knob. With a twist of the large knob on the front of the nozzle, operating pressure can be immediately adjusted to tactile detent settings between 70 and 120 psi (4.8 and 8.3 bar). At pressures other than 100 psi, maximum flow is determined by K-factor of 150. This series is the only variable pressure nozzle with a flow range of 600 - 4000 gpm (2400-16000 l/min). The Master Stream 4000 features a unique user selectable operating pressure control. The Master Stream 4000 can provide industrial users the highest flow and longest stream reach of any constant pressure, variable flow nozzle in the world. Similar to other automatic TFT nozzles, the Master Stream 4000 can maintain a constant pressure throughout its flow range. The operating nozzle pressure of the Master Stream 4000 is field adjustable. An optional selectable nozzle is readily available with flow settings of 2500 & 5000 gpm (10000 & 20000 l/min) at 100 psi (8 bar).